Pros: The actors present an impressive range of characters and typecasts. Interesting but twisted language choices make the script unique and catches viewers’ attention. Cons: Much of the comedy is lost through the cast’s gallant struggle to convey the dense and overly complex language of the piece. 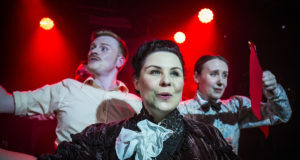 This black comedy about the death of theatre may be of interest to some fringe theatre enthusiasts, but is difficult to engage with and may leave general audiences with a headache. 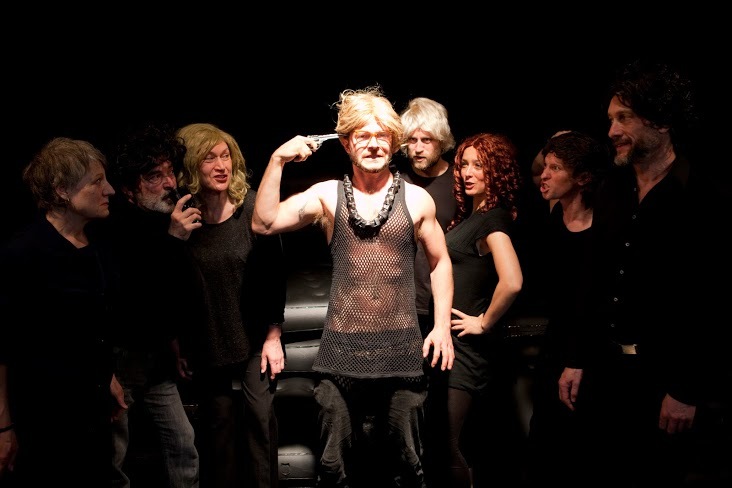 Dead At Last, No More Air is described by its late author Werner Schwab as a ‘theatre-extinction comedy’. It abuses and abandons a staggering number of theatre conventions to show us the failure of established theatre to convey meaning to an audience. This ‘play within a play’ starts out in a rehearsal that goes off track. A playwright is dismissed by a director who replaces the fictional cast with old age pensioners from a nearby residential home. The seniors act out the new play until, with the help of a downtrodden but enterprising cleaner; they overthrow the director and collapse the grand institution of theatre he represents. The 60-seat black box studio theatre of the Camden People’s Theatre is a suitably sealed room for this interrogation of theatrical practice. Scenographer Simon Donger ensures there is plenty of air at the start of this play. Ten black air mattresses to be precise. The cast of eight shift them about throughout the show, using them to construct a stage or setting, and lounging around on them as if what’s happening around them is of no consequence. They also make up the first row of the audience and whizz to and from their seats, changing wigs and costumes, and pulling out inflatable props. All to show up as incredible and ridiculous the conceits that theatre uses to create realistic and convincing drama. Unfortunately, Schwab’s contorted language, translated by Meredith Oakes, was for me too severe a mental challenge. It doesn’t let up for a moment, preventing much of the comedy from shining through. Though the actors were impressive, they struggled to handle the often expressionless but complex dialogue, often having to feel nothing behind what they say. The result was, for me, almost total disengagement. Schwab’s penchant for grubbiness and the focus on bodily functions lost any of its power to disturb. I hadn’t the faintest idea what to make of the sultry actress’s onstage eating of a banana, the playwright’s drinking of schnapps, the camp stage designer’s spiting and retching, and the playwright’s peeing on stage out of fear. Perhaps in its native German, the piece has a context and potency that is lost through translation and Austria’s distinctly conservative political context. I was exhausted by the end from trying to distinguish between what was real for the characters and what was the theatre play being performed. I would absolutely recommend Dead At Last, No More Air to anyone with an academic interest in theatre. If any of these terms appeal to you – Pataphysical theatre, postdramatic theatre, Theatre of Brutality, anti-theatre, In Yer Face theatre, Meta-theatre (whether you know what they mean or not!) 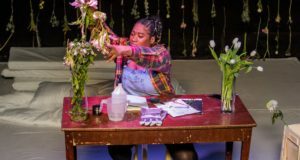 – it’s a strong indication that you should give this show a go, but for those of you looking for dinner and a show date night, it’s probably best to avoid the Camden People’s Theatre this coming week.